Although Alaska Raptor Center takes in injured or starving birds of all kinds during the year, it specializes in birds of prey: eagles, hawks, and owls. 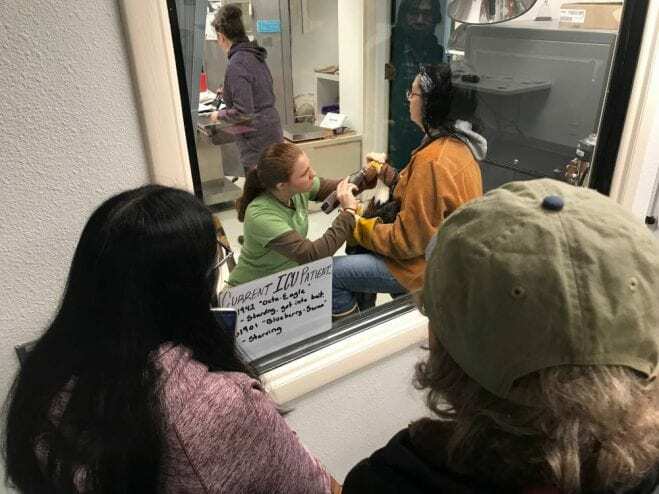 To give them a better chance at full recovery in the wild, the center delays the release of its raptors until herring and other prey are back in Sitka Sound and spring is in the air. 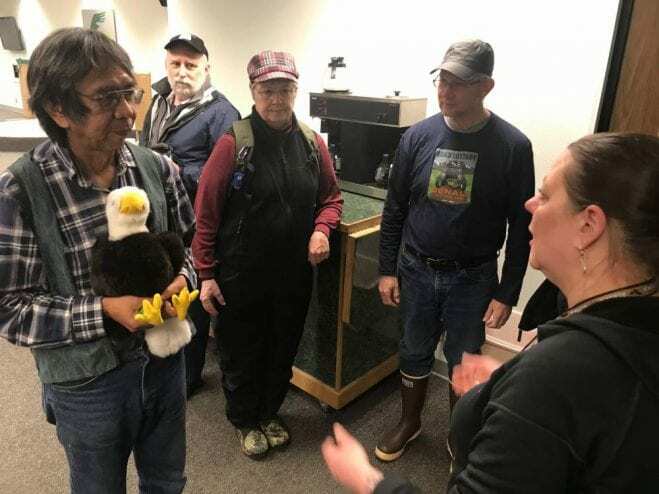 During the spring release, staff and volunteers of the Alaska Raptor Center step aside and allow contributing members, donors, and outstanding Sitkans to set the birds free; people like Sitka Tribal Council member Bob Sam, whose father was an Eagle. Before seeing the actual raptors, Sam and others releasing eagles and hawks don thick leather coats and gloves and are instructed on how to safely handle the raptors using a plush bald eagle. Sam listened attentively to instructions but his joy and excitement was apparent. Meanwhile, inside the center’s clinic, Avian Director Jennifer Cedarleaf works to make sure the birds are ready for release. There’s nothing she and the medical team want more than to release eagles back into the wild. But it’s not as simple as opening the birdcage door. Cedarleaf and her teammates examine the birds before they’re set free to make sure they’re healthy. They make sure birds have recovered from their initial injuries but have also taken well to being held in captivity. Holding onto a wild bird to examine it is not easy either, especially once it’s healthy. Cedarleaf says that’s when they have energy to resist and that can be potentially dangerous. Injured birds usually stay at the Raptor Center for about 6 months, unless they have broken bones which take longer to heal. In January, Cedarleaf says the center admitted about 30 starving eagles that struggled to find food when the salmon stopped running in streams. But now in the spring, with herring back on the menu, it’s time to set the raptors free. While Cedarleaf and her team examine the birds, a crowd of Sitkans gathers in a muskegg where they wait with their cameras at the ready. 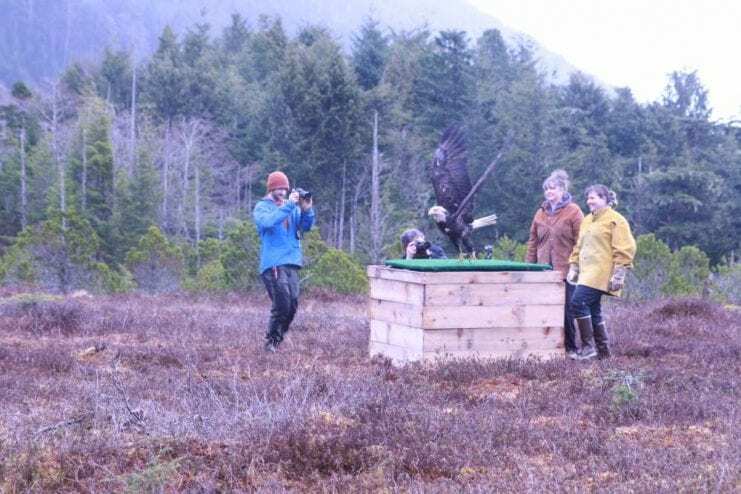 Executive Director Jen Cross says the first eagle release has become a Sitka tradition to welcome the spring. Witnessing the release of a raptor is exciting for most and sometimes overwhelming for those releasing the birds, Cross said. “Just knowing that this bird was close to death at one point has beaten the odds and is now going to fly free,” she said. “Birds hold a special place in the human heart. When people are taking a small part in sending the bird back to where it belongs, I think that’s quite powerful. The crowd counts down and falls silent once the eagle takes off, except for the click of their camera shutters. The Raptor Center released seven birds during their first release and will continue to let raptors soar throughout the summer and fall while herring and salmon are plenty in the wild.